Using quasars to measure the rate of the expansion of the universe has great potential, since we can observe them out to much greater distances from us than type-Ia supernovas to probe much earlier epochs in the history of the cosmos, says astronomer Elisabeta Lusso of Durham University. 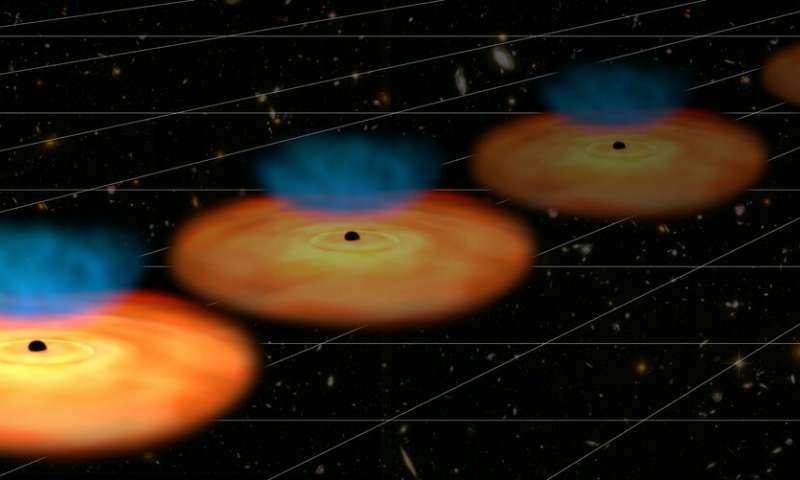 Quasars, the ancient cores of galaxies where an active supermassive black hole is pulling in matter from its surroundings at very intense rates, are located at increasingly larger distances from us. Investigating the history of our cosmos with a large sample of distant ‘active’ galaxies observed by ESA’s XMM-Newton, a team of astronomers found there might be more to the early expansion of the universe than predicted by the standard model of cosmology. Three years ago, Guido and Elisabeta realized that a well-known relation between the ultraviolet and X-ray brightness of quasars could be used to estimate the distance to these sources – something that is notoriously tricky in astronomy – and, ultimately, to probe the expansion history of the universe. “Such a large sample enabled us to scrutinize the relation between X-ray and ultraviolet emission of quasars in painstaking detail, which greatly refined our technique to estimate their distance,” says Guido. The new XMM-Newton observations of distant quasars are so good that the team even identified two different groups: 70 percent of the sources shine brightly in low-energy X-rays, while the remaining 30 percent emit lower amounts of X-rays that are characterized by higher energies. For the further analysis, they only kept the earlier group of sources, in which the relation between X-ray and ultraviolet emission appears clearer. Graph showing measurements of the distance to astronomical objects such as type-Ia supernovas (cyan symbols) and quasars (yellow, red and blue symbols) that can be used to study the expansion history of the universe.